Arizona park models headquarters for thousands of snow birds and full timers. If there is a capital of the park model way of life it has to be the Phoenix area, specificallyMesa. 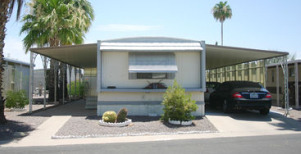 Mesa is a large, over 400,000 residents, located east of Phoenix close to the Superstition Mountains. You will have dozens of parks to choose from and hard decisions to make. Do you require a golf course? Do you want a gated community? Do you want a woodshop? Do you want a computer lab? Do you want a line dancing class? Do you want a small park, 200 units? Do you want a large park 2500 units. The choice is yours with an Park model. Why Arizona park model communities? Arizona is number one because of our climate. You will like it as well. 50s to 70s in the winter, 110s in the summer. But most folks that live in Arizona park models are winter visitors...or snowbirds as they are called. That is not a bad name at all...us year rounders just think you are smart. The fact that there's upwards of 320 days of sunshine every year doesn't hurt the attraction of Arizona. Why is it cheap living? It is in a gated community with more activities than you can possibly partake in. Now I don't know about you but when you can purchase a small home for $20 a foot you can see why your dollar goes a long way in Arizona. Of course if that is a bit much,here is a 1,000 square foot home, not in a gated community and not on the ground. You can buy this home for around $12,000...and it is furnished. The monthly park fee is $450. These are not isolated one of units. You will have hundreds to choose from. Making up your mind on which bargain to snap up may take more time than you think. 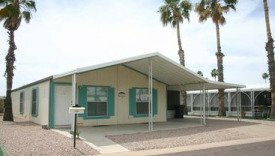 With housing this affordable it is little wonder that you should consider Arizona park model communities for the cheap living they provide. Among the dozens of parks to choose from you will find a new home that meets your needs. Most are age restricted where one party has to be 55 or over. I doubt you will have to dodge any hot wheels, unless the grand kids visit. The activities in these park is truly mind boggling. If you want a polka club, or a scrapbooking club, you can find it in Arizona.